If you are captivated by the lovespoon tradition, but aren’t in the position to commission one of mine, then consider buying either or both of my books, “The Fine Art of Carving Lovespoons” and "History of Lovespoons". Both are available through Fox Chapel Publishing (www.foxchapelpublishing.com) and all retail and internet book dealers. ​In no time, you can learn all you need to know to make one of your own. 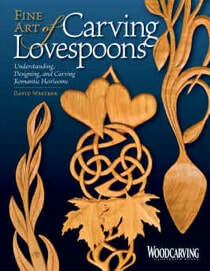 With 188 glossy and lavishly illustrated pages, my definitive book, "Fine Art of Carving Lovespoons" will guide you though every step of the lovespoon making process. For just a few dollars, you can profit from my lifetime’s experience lovespoon carving. Unlike me, you’ll learn all the hard stuff the easy way. If you just want to learn about the tradition and view some of the astounding historical and modern lovespoons which have been carved over the centuries, my book, “History of Lovespoons” is also available through Fox Chapel or online! This book represents the most thorough and up-to-date look at the lovespoon tradition. A must have for anyone interested in this vibrant and meaningful craft! !